Rims constitute some of the few remaining ornaments of car design, which, since the crisis of functionalism in the 1960s, has been increasingly subjected to symbolic and economic conditions. Though following the same parameters, rims continue to ride out the increasing aerodynamics of the contemporary chassis. 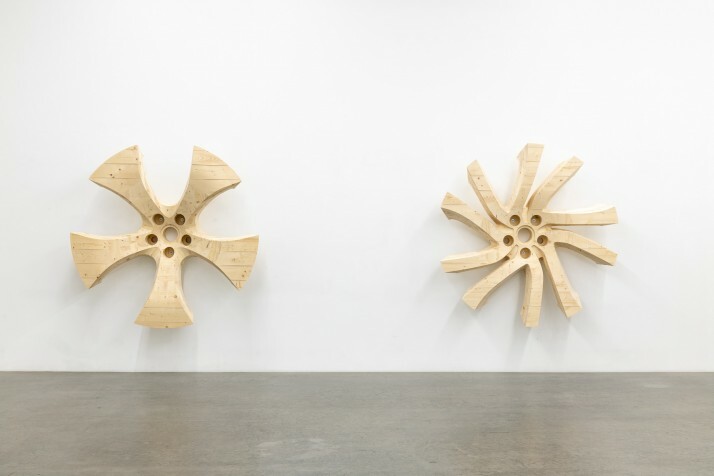 The Norwegian-German artist Yngve Holen is interested in the tension of a single object’s formal design languages, and how it reveals social status and wealth. 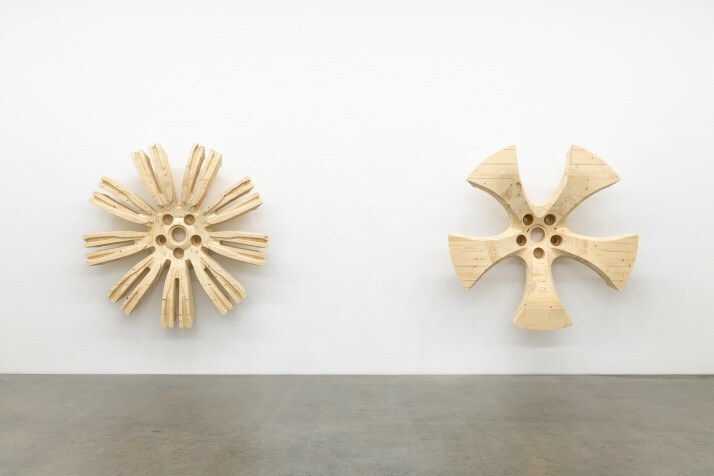 Just like car lights, which also allow for formal embellishments, rims have been used as raw material in Holen’s work. The artist deprives them of their original function by isolating and altering them, before transferring them into the context of art, posing questions about the distribution of wealth, psychosocial design, and the fetishization of objects. Yet it is the role of the ornament that is most interrogated here. At least since the publication of Adolf Loos’s Ornament and Crime, in 1908, the ornate has been seen as political, but this reduction by alleged modernism can at the same time be considered a well-concealed, conservative, and reactionary mentality. For his second solo show at Galerie Neu, Holen “gutted” the rims of five different sports utility vehicles. They were then 3D-scanned, scaled to a diameter of two meters, and optimized to be milled in cross-laminated timber (CLT). Through this process, the artist both appropriates the object and undermines classical principles of sculpture. Rims are typically made of aluminum, a material whose ambivalent value bears, on the one hand, the symbolic aura of modernity, while on the other, the “stain” of a cheap substitute. By rescaling the objects, Holen exaggerates the form in a material that is commonly understood as more valuable, traditional, and environmentally sustainable. 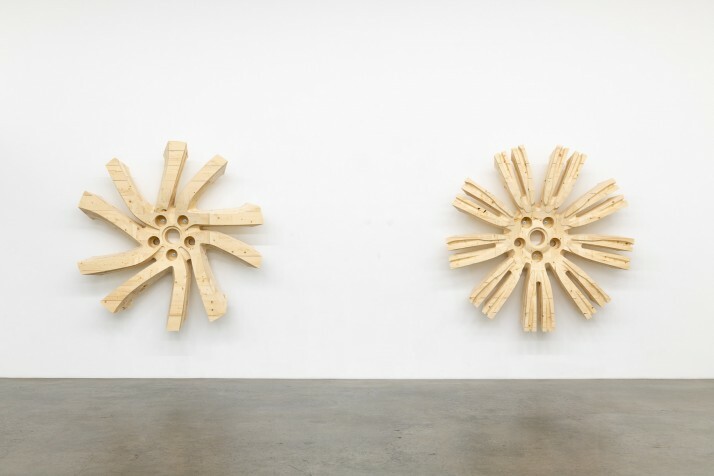 In this case, however, “woodcarving” is obviously the product of a technical process: the milling traces, tears, and cracks expose an industrially prefabricated resource sculpted by a machine. Holen’s choice of cross-laminated timber may be understood as a commentary on the recent boom of this material in architecture and building. Its common use is an expression of allegedly ecological behavior, though it can also be understood as a symptom of contemporary taste torn between a longing for tradition and an ever-increasing dependence on highly technologized innovation. The artworks similarly point to the schizophrenic contemporary relationship to automobiles. Optimization of car use and reduction of emissions, as well as the sustainability of production, are challenged by the popularity of SUVs—a type of vehicle that is ecologically questionable due to its high consumption of gas, and whose design endangers other drivers and pedestrians in favor of comfort and style. Casualties are more likely in collisions with an SUV than with other types of cars. In a free adaption of Bourdieu, it could be said that the design and the possession of SUVs do not only mean “symbolic capital” or “symbolic violence,” but also actual physical violence. Consequently, the title Rose Painting proves to be more than a biographically tinged reference by the artist to the Norwegian tradition of rosemåling, or a simple nod to unagitated craftsmanship in contrast to the dynamics of industrial processes. It points directly to the function of ornament not only to embellish an object, but also to give it a different value and connotation. One would almost prefer to say, “rose-tinted whitewashing.” Just like Holen’s first solo exhibition at Galerie Neu, World of Hope, the show resounds in various ways with the today’s existential state smoldering with the potential of catastrophe.